It’s a Bagel! It’s a Pretzel! It’s a Pretz-a-bagel! Snack pretzels are far from my favorite food. You will never find a bag of pretzels in my house; I just don’t eat them. I enjoy the bagged pretzel’s cousin, the soft pretzel, but they are kinda like Big Foot—I don’t cross paths with them often. 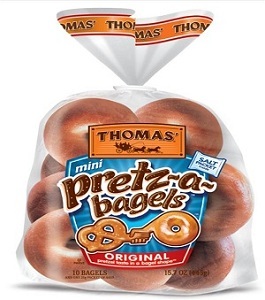 So when Thomas’ sent me a bag of Pretz-a-bagels this week to celebrate National Pretzel Week, I was intrigued. We’re no stranger to Thomas’ around here. I’ve been enjoying the nooks and crannies on their English muffins for years, and Jenn just ran, er, walked a half marathon for team Thomas, so I had a sneaking suspicion that I’d like this hybrid snack. And I did. Darnit, I did. The 120-calorie mini bagels come in a 10-pack, with a tiny bag of that extra-special pretzel salt should you need it. And while not nutritional powerhouses or anything—you get 4 grams of protein and less than 1 gram of fiber—you can always add some natural peanut butter or a slice of cheese to up the nutritional value for a snack your kiddos will love. They truly are a perfect blend of soft bagel with that special pretzel taste. And the crunch of the added salt? I am a sucker for these things. These are so cute! I hunt my 99 cent store for no salt added Pennysticks brand log pretzels. When I find them, I practically buy every bag. They help me with nausea, and I get tired of crackers and hard candy. I usually don’t do well with breads but haven’t tried the hybrid. I’m sodium-sensitive so maybe try them after a good sweatfest! I don’t know if this is a regional thing or what but mine here in IL did not come with the additional pretzel salt! I was bummed, contacted the company and they sent me coupons so maybe thy just don’t include it at all anymore.